Stackable case 400x300x235 with solid sides and base. Buy online from Utz Group | George Utz Ltd.
Euro Container RAKO® 400x300x235mm with solid side walls and base and 2 shell handles. Assembled as a case, with hinged lid, snap locks and hinge cylinders. 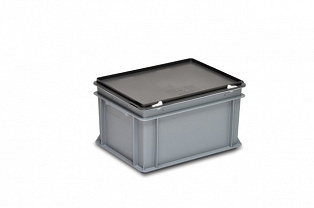 These cases are ideal for the storage and transportation of goods in all industry areas.